At a recent school board meeting in New Orleans, more than 100 parents swamped the hearing room, requiring dozens to have to stand. Many of the parents had filled out public comment cards so they would be allowed to address the board. What most in the crowd came prepared to talk about were their concerns about recent recommendations by the superintendent to close five schools and transfer the students to other schools in the district. Their demand was for the elected board to take a more hands-on role in improving the schools instead of closing them down. But when Ashana Bigard, a New Orleans public school parent and advocate, realized the board had altered the agenda, and limited parents’ comment time, she decided to speak out of turn. “How is closing the schools helping our children?” she asked the board members. She pointed out that many of the children in the schools being closed are special needs students with serious, trauma-induced learning disabilities, and now these children are being uprooted and transferred to schools that lack expertise with these problems. “These children have been experimented on for too long,” she declared. That’s when a district staff member intervened and escorted her out of the room. Parents’ protesting a school closing is nothing new. But for parents to demand that their local board take more control of the school, and run it directly rather than closing it down, is a twist. That’s because this is New Orleans. In the bizarre landscape of New Orleans schools, since they were taken over by the state and reorganized after the devastation of Hurricane Katrina, all but two of the 79 schools are directed by charter management companies, privately owned contractors that receive taxpayer money to run the schools. The charter management firms have near-complete autonomy, and while the Orleans Parish School Board was recently given the power, by the state, to open and close charters, the day-to-day operations of the schools are still handled by the charters’ appointed boards, generally free from any demands from parents and voters. It’s that arrangement that is at the heart of these parents’ complaints. With the elected board’s powers being limited to decisions on opening and closing schools only, “Parents feel they have no voice in the system,” Bigard explains in a phone conversation, and charter operators have way too much power and autonomy to allow school conditions to worsen to the level that closure becomes the only option. “We need to have our elected board hold charter schools more accountable” for their day-to-day operation, she says. That would mean having the elected board impose the demands of parents and voters on charter management companies and assert more authority on how charters are run. A more assertive board, Bigard argues, could impose much-needed reforms on the charters rather than closing them down or handing the schools over to a different management company—that will likely do no better than the last one did. “Parents want real voice and real democracy,” she says. What Bigard and other New Orleans parents are demanding has been the tradition in American communities, where local schools have long been governed by democratically elected boards. But that American tradition has been undermined or overturned, especially in communities of color, where less democratic forms of governance have become widespread. For decades, a wave of state takeovers of school districts overseeing tens of thousands of students has stripped elected school boards in these communities of their governing power and denied voters the right to local governance of their public schools. These state takeovers have been happening almost exclusively in African American and Latinx school districts—many of the same communities that have experienced decades of economic decline, high unemployment, and underinvestment in schools. What tends to accompany these state interventions are mass closing of public schools and the imposition of various forms of privately controlled school models, such as charter schools. Since 1989, there have been more than 100 takeovers of local school districts in the United States, according to Domingo Morel, author of the book Takeover: Race, Education and American Democracy. In nearly 85 percent of these cases, the districts have been majority African American and Latinx. Also, black communities disproportionately experience the most punitive forms of takeovers, in which elected school boards are disbanded or turned into “advisory” boards, school superintendents previously hired by elected boards have been fired, or governing authority has been handed over to state-appointed managers or private management companies. Although the takeovers are usually justified for academic reasons, Morel points to research showing takeovers generally do not have a significant effect on school improvement. Instead, what really motivates takeovers, according to Morel, is politics—especially the political undermining of black and brown governance of schools in urban communities. Morel traces the rising popularity of takeovers to the 1970s and early 80s, when blacks in big cities across the country gained majorities on city councils and school boards. He argues that the power of the rising black electorate created political problems for conservative leaders in state government who did not want to see governance in large urban communities fall into the hands of local lawmakers who were from the opposition. That political dynamic was at work especially in New Jersey, where, in 1988, state lawmakers passed the first law allowing the state board of education to take control of local school district governance. Two of the state’s largest school districts, Jersey City and Newark, were the first to draw the attention of Republican governors, and those two districts were taken over by the state in 1989 and 1995, respectively. But while state takeovers have been mostly about politics, in more recent years, another factor strongly motivates these interventions: public school privatization. “State takeovers and the elimination of locally elected school boards grease the rails of privatization by charter school management groups,” Jitu Brown tells me. Brown is the national director of Journey for Justice, an alliance of grassroots community-, youth-, and parent-led organizations in 24 cities that oppose privatizing schools and advocate for community-based alternatives instead. In 2016, Brown and 11 other public school advocates in Chicago made headlines when they staged a hunger strike to protest the closing of Dyett High School. Their demand was to reopen the school as a full-service community school focused on a green energy curriculum. After 34 days of the strike, the district administration relented and reopened Dyett in 2016, as a school for the arts, after $14.6 million in refurbishing. Brown attributes much of the growth of charter schools to the federal government, especially during the presidential administration of Barack Obama, whose Education Secretary Arne Duncan incentivized privatization through a School Improvement Grants program. The grants required struggling schools in the most vulnerable communities to undergo turnaround efforts that often included handing control of schools over to charter management firms or closing schools and reopening them as charters. The Obama administration and Secretary Duncan also incentivized charter school expansions through the federal government’s Race to the Top program and through its charter school grant program. At the same time the federal government was incentivizing charter school expansions, there was a powerful and well-financed movement to eliminate traditional urban school districts and their democratically elected school boards. Funded by right-wing political advocacy groups, influential private foundations, and tech moguls from Silicon Valley, the movement decried the “chaos” of democratically elected school boards and advocated instead for an “open market” where parents take their chances on loosely regulated charter schools. The push for privatization has been particularly consequential in urban communities of color such as Newark, New Jersey. “Since 2008, the share of students who attend charters in Newark has nearly quadrupled—from 9 percent in 2008 to about 35 percent today,” Chalkbeat reports. “By 2023, that number could swell to 44 percent, according to one estimate, as the city’s charters continue to fill seats that were preapproved by the [former Republican Governor Chris] Christie administration.” About a quarter of the district’s budget—$237 million—goes to charter schools, up from $60 million ten years ago. But state takeovers and the ushering in of charter management “never address the structural inequity in the system,” according to Brown. Regardless of the change in governance, urban schools for black and brown students continue to be plagued with large class sizes, punitive discipline codes, rotating faculties of inexperienced teachers, and curriculums void of advanced courses in world languages, art and music, and higher-level math and science. With undemocratic governance, the inequity often worsens, Brown argues. Communities like Newark “have had the right to self-determination snatched from them,” he says. “If they don’t have the right to govern their own schools, then people who take the schools over operate the schools based on their opinions of people in the community,” rather than on the desires of parents and voters. However, there are recent signs these communities are fighting back and frequently winning to gradually claw back their local, democratic governance. In New Orleans, the community had its first victory in July 2018 when Louisiana gave a locally elected school board power to open and close charters. In Philadelphia, 16 years of governance by a state-appointed commission ended in June 2018, and governance power transferred to a local school board appointed by the mayor. And more recently in New Jersey, three districts—Paterson, Newark, and Camden—voted for democratically elected boards and the power to hold local board members accountable at the ballot box. State takeovers had ended in Newark and Paterson earlier this year, and Camden is still under state control, but when voters in these communities had the opportunity to decide whether they wanted schools to be run by an elected board or a board appointed by the mayor, they voted overwhelmingly for elected boards. 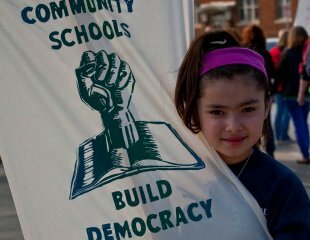 “To have a chance to regain an elected school board in these New Jersey communities and then see voters come out and actually vote for democracy is a testament to the work of grassroots advocacy groups in these communities,” says Brown, pointing to three Journey for Justice member groups—Camden Parent and Student Union, Parents Unified for Local School Education (Newark), and Paterson Education Organizing Committee. “These groups have achieved a strong victory against inequity and privatization,” he says. The “establishment” Dickerson refers to has been closely aligned with an invasion of Renaissance Schools, a form of privatization in Camden that transfers administration of a public school to a charter management group or allows a charter firm to “co-locate” a school in an existing public-school campus. The introduction and expansion of Renaissance Schools has deeply divided the community and has resulted in charges that these schools serve far fewer percentages of students who have learning disabilities or who don’t speak English well. In Newark, state takeover also led to increased corruption according to Johnnie Lattner of Parents Unified for Local School Education. Similar to Camden, he believes the state-appointed board had become accustomed to selecting members who had links to charter schools. Although he concedes the influence of the charter industry will likely still exist under an elected board, because of the “money and manpower” behind candidates backed by charter advocates, “Elections are the only way they’ll feel the pressure of parents and voters,” he says. The successful efforts to take back local control and democratic governance of schools by grassroots groups like the ones in New Jersey have “changed the conversation about privatization,” according to Brown. Of course, no one expects democratically elected school boards alone to fully address the challenges that schools in urban black and brown communities face. Research studies on the impact school boards have on student achievement are few and far between and often find the effects have more to do with how the board behaves rather than the process that created it. But grassroots organizers fending off privatization and fighting for elected school boards understand a democratically elected board is just the beginning in winning back more parent and citizen voice in their districts. They believe their communities have more leverage when they at least have the opportunity to vote inattentive board members out. “Was the elected school board in New Orleans before Katrina sometimes inattentive to the needs of parents?” asks Bigard. “Sure,” she says, but under state control, the appointed board wasn’t accountable either. Schools no longer had music and art classes and advanced courses in science and math. Charter schools didn’t follow the laws, especially for how to educate students with disabilities. And parents didn’t have anyone to call to complain to. Even before the votes from the recent midterm elections were completely counted – a process that took nearly two weeks in many races – numerous prominent news outlets were quick to report on the supposed failure of the “education wave,” those school teachers and other educators who ran for office up and down ballots across the country. One report that received particularly widespread circulation, by Associated Press, carried the headline “Tough lessons: Teachers fall short in midterm races.” Another for U.S. News & World Report said, “Poor Marks for Teachers in Midterms.” Clever, huh. 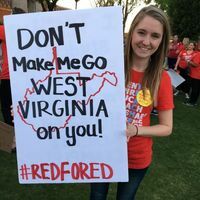 In West Virginia, where teachers started the wave of walkouts that rippled across the country, “the teachers strike woke up countless women voters to both run for office and support other women doing the same,” says Gary Zuckett. Zuckett is the Executive Director of West Virginia Citizen Action Group, a grassroots progressive advocacy that canvassed and phone-banked to elect a slate of candidates who support public schools, environmental protections, affordable healthcare, and other progressive issues. Zuckett believes the statewide teacher walkouts in the Mountain State inspired a group of first-time candidates, mostly women, to join with other progressive women incumbents to form a unified slate they call Mountain Mamas to press for their issues . Seven of these women candidates won their races, two of whom are women of color won. Zuckett also attributes the defeats of two powerful Republican lawmakers – Robert Karnes, the vice-chair of the Senate Education Committee who lost in the primary, and Joe Statler, the vice chair in the House who lost in the general election – to their vocal opposition to the teacher walkouts. In Kentucky, the next state after West Virginia to experience teacher walkouts, “Republican incumbents got a lot of opposition they had never seen before, much of it coming from teachers who ran pro-public school campaigns,” Chris Brady tells me. Brady is a second term school board member in Jefferson County, which includes Louisville, who has managed to defeat big-money candidates backed by conservative Republicans two elections in a row. Brady points to the victory of special education teacher Tina Bojanowski, who unseated two-term Republican incumbent Phil Moffett, as a sign the teacher walkouts mattered in November. At least 10 current or former teachers who ran for office in 2018 won. “The number of educators now elected to the Kentucky House of Representatives is 14. Half of them are Republicans and half are Democrats,” Gay Adelmann tells me. Adelmann is a public school parent in Louisville and current president of Save Our Schools Kentucky. She recently ran for state Senate in the Democratic Party, losing in the primary with 44 percent of the vote as a first-time candidate with little funding. Grassroots public school activists animated by teacher walkouts earlier this year, “specifically targeted” legislators who voted against public schools, she tells me. While many of those incumbents won anyway, some prominent lawmakers fell, including the sitting House Majority Leader who lost in the Republican primary to a high school math teacher. In Oklahoma, the next state to experience mass teacher walkouts, “this spring’s teacher uprising poured a Blue Wave directly into a glass half full for educators,” writes retired teacher John Thompson for The Progressive magazine. “Though Democratic gubernatorial candidate Drew Edmondson’s loss to Republican newcomer Kevin Stitt prompted Oklahoma press to dub the November election a “disappointment” for teachers, the story is more complicated,” argues Thompson. As evidence for the impact of the teacher walkouts, Thompson points to the big jump in the state legislature’s Education Caucus – “growing from nine members to 25 or 26 – and a “near-tripling of the caucus” if legislators who are former educators or who got their starts as education advocates are included in the count. Thompson points to gerrymandered districts, “where it would seem impossible to elect a Democrat,” that swung blue due in part to education advocacy, including a “Republican stronghold in Oklahoma City,” where four progressive Democratic women won, including a surprising win for Democrat Kendra Horn over incumbent Republican and Steve Russell for a seat in the U.S. House. “It’s clear that the teacher resistance contributed to a bipartisan sea change in Oklahoma governance, Thompson concludes. In Arizona, where teachers inspired by their colleagues in other red states walked out of school en masse, “the #RedforEd movement had an enormous impact on the elections,” says Beth Lewis. Lewis helped form and currently leads Save Our School Arizona, a grassroots organization of teachers, parents, retired educators, and public-school advocates that successfully pushed a referendum onto the ballot, Proposition 305, that let Arizona voters decide the fate of a bill passed in the state legislature that would expand a school voucher program statewide. The defeat of Prop 305 in the November election was a huge win for public schools. While most educators who ran for office in the state lost, there were exceptions that can be credited to the success of teacher activism. In a huge upset, second-time Democratic candidate Jennifer Pawlik, a former elementary school teacher, prevailed in legislative district that had never gone blue, in its current configuration. She calls her victory a product of a “perfect storm” that included coalition-building in her district and the teach walkouts that called voters’ attention to the crisis in Arizona schools. What’s also under-appreciated about the impact of teacher walkouts in midterm elections is their influence in states that did not experience walkouts. In Wisconsin, for instance, education was a top factor, second only to healthcare, in defeating [incumbent Republican Governor] Scott Walker,” says Robert Kraig. Kraig is Executive Director Citizen Action of Wisconsin, a grassroot organization that campaigned hard for Walker’s successful challenger, longtime state school superintendent Tony Evers who called out Walker for his horrible track record on funding education. “The highly visible strikes emboldened educators and public-school supporters in a way that benefited candidates running on increasing investments in public schools,” says Kraig. The teacher uprisings “also took the issue away from Republicans” when Walker tried to run as an “education candidate” but couldn’t run away from the massive cuts he’d enacted to the system. Overall, it’s very difficult if not impossible to calculate the real impact teacher activism had in the midterms – especially in states where teachers didn’t walk out – and reports on the power of teacher activism will rely mostly on anecdotes. While that certainly sounds like a poor record, what was the percent of wins for any other occupation running for office in the midterms? Further, when there is a surge of first-time candidates associated with an emerging, grassroots movement not funded by corporate PACs and powerful political groups, what would normally be considered a good showing? To write off the impact of teachers and education advocates on elections with all-too-clever headlines is slipshod reporting that sells short not only the intelligence of voters but also the power of democracy. Virginia Teachers Plan To March At The Capital. Will They Shut Down Schools? EON is taking a holiday break from the education scene. Look for the next email in your inbox on November 29. Those who speculated that the Democrat’s prospects in the midterm elections would only happen if they won big in the Midwest were prescient. Indeed, it’s hard to make the argument that any semblance of a Democratic Party “wave” would have been possible without key wins in these states. The need for Democrats to prevail in the Midwest was critical to the party’s success. Donald Trump won Indiana, Iowa, Michigan, Ohio, and Wisconsin in 2016 and came close in Minnesota. But a perhaps more important trend in these states had been the Republican dominance down ballot where Republicans controlled both chambers of state legislatures and governors and most of the U.S. House seats in Michigan, Wisconsin, Iowa, Indiana, and Ohio. In the 2018 midterm contests, that trend took a substantial turnaround. Of the 75 Republican Congressional Representative seats that were rated “vulnerable,” 28 flipped Democratic, so far, and 12 of those red-to-blue flips were in the Midwest – four in Pennsylvania; two each in Illinois, Iowa, and Minnesota; and one each in Kansas and Michigan – more than any other region. The Democratic Party held on to vulnerable Senate seats in Ohio, Michigan, Minnesota, Pennsylvania, and Wisconsin. In state races, of the seven governors who flipped red to blue, four were in the Midwest – Kansas, Illinois, Michigan, and Wisconsin. Democrats flipped the Minnesota House, broke a Republican super-majority in Michigan, and won a super-majority in Illinois. The importance of Midwest races to the Democrats should also be appreciated because of what the winning campaigns were about, more often than not. Democrats running for offices across the Midwestern states ran against “the Republican establishment rather than against Mr. Trump,” according to political analysts for the New York Times. “Democrats in these states ran on health care, education, and other bread-and-butter issues,” writes Jennifer Rubin, a Republican political analyst for the Washington Post. Education was “the major theme,” writes Ruth Conniff for The Progressive – especially in Wisconsin races, but also throughout the region. Indeed, up and down the ballots, especially in state contests, Democratic candidates emphasized increasing school funding and ending or at least providing greater government control of school privatization efforts, such charter schools and voucher programs that give families public funds to transfer children to private schools at taxpayer expense. In Michigan, Gretchen Whitmer knocked off her Republican opponent for an open but previously Republican-held governor’s seat by campaigning on women’s reproductive health and investing in public infrastructure – especially in public education. She won the backing of the National Education Association by calling for greater investments in schools, ending for-profit charter schools, and enacting more accountability for nonprofit charters. In Wisconsin, where voters rated education a top issue in the election – with 40 percent saying it’s a first or second priority, second only to the economy at 41 percent – longtime state school superintendent Tony Evers defeated two-term incumbent Republican Governor Scott Walker. Evers drew a sharp contrast to Walker, who had made Wisconsin a national leader on cutting education funding. “Evers proposed increasing funding for schools by $1.4 billion over the next two years,” while Walker pledged increased support but left few details. In Kansas, Democratic State Senator Laura Kelly defeated Secretary of State and Trump ally Kris Kobach for an open governor’s seat long held by Republican Sam Brownback, who had a disastrous legacy of crippling tax cuts that left schools so inadequately funded that the state Supreme Court sued state lawmakers. Kelly called for increasing spending on local schools, while Kobach maintained the state “couldn’t afford” to adequately fund schools. Pennsylvania reelected Democratic Governor Tom Wolf who was swept into office by a wave of opposition to the previous governor’s massive budget cuts to public schools. In this year’s midterms, voters in state level races flipped a substantial number of seats in the State Senate and House from Republican to Democratic, although Republicans remain in the majority in both houses. In Illinois, Democratic challenger J.B. Pritzker defeated incumbent Republican Governor Bruce Rauner, in part, by drawing stark differences on education. While Rauner pledged to expand the state’s voucher program to $100 million tax credit scholarship “to a billion” dollars if he could, Pritzker said he’d curtail the program, which already diverts public tax dollars to pay for private school tuition for 5,600 students, and use that money instead for public education. In Minnesota, voters elected Democratic candidate Tim Walz, to an open governor’s seat.. Walz, is a former public high school geography teacher and football coach, who during his tenure in the U.S. House of Representatives authored the Forever GI Bill to expand veterans’ education benefits and voted against a school voucher program the federal government funds in Washington, D.C.. While he made support for public schools a cornerstone of his campaign, his opponent Jeff Johnson insisted that what Minnesota families need is a voucher program like Michigan’s or Wisconsin’s that would direct public education funds to private schools. Walz pledged to block any proposed voucher programs. Of course, Democrats had setbacks in the Midwest too, especially in Ohio where a strong candidate for governor lost to a vulnerable Republican. 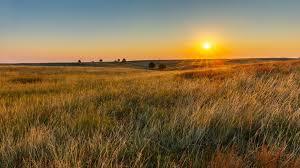 But as Democrats now prepare for hopefully bigger wins in 2020, the party should take the valuable lessons learned from the Midwest midterms to heart. Betsy DeVos Was Asked Whether U.S. schools Are Teaching Kids To Be Socialists. Her Answer Was Rich.